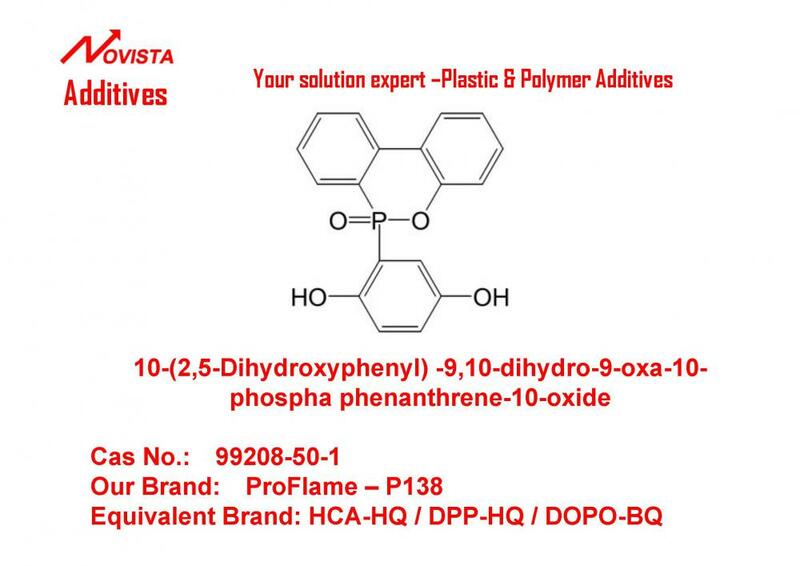 10-(2,5-Dihydroxyphenyl) -9,10-dihydro-9-oxa-10-phospha phenanthrene-10-oxide is our main Flame Retardant ,it serves as stabilizers and flame retardant for polymers. It also can be copolymerized in epoxy, polyester, polyurethane resins to exhibit superior stabilization effectiveness and flame retardance effectiveness with resistance to solvent extraction, volatility and blooming. It serves as stabilizers and flame retardant for polymers. It also can be copolymerized in epoxy, polyester, polyurethane resins to exhibit superior stabilization effectiveness and flame retardance effectiveness with resistance to solvent extraction, volatility and blooming. Looking for ideal Flame Retardant DOPO-HQ HCA-HQ DPP-HQ Manufacturer & supplier ? We have a wide selection at great prices to help you get creative. All the CAS NO 99208-50-1 are quality guaranteed. We are China Origin Factory of Phosphorus Flame Retardant. If you have any question, please feel free to contact us.